End the revolving door of consultants. RCM Blitz ™ puts the tools in the client's hands, integrating RCM into thier culture. What can RCM Blitz ™ do for You? What Can RCM Blitz™ Do For You? 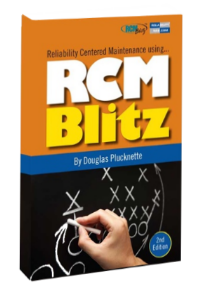 RCM Blitz™ is an overall reliability strategy grounded in a fundamental understanding of how equipment fails. From the beginning RCM Blitz™ was created to identify and mitigate the failure modes that result from the context in which you operate your equipment and the environment in which it operates. The result is a complete maintenance strategy that includes Condition Based, Failure Finding, Preventive, and Operator Care Tasks. Developed in 1997, the RCM Blitz™ method has been applied to existing equipment as well as new designs for companies both large and small in countries around the world. Contact us to learn more about Reliability Centered Maintenance. Why RCM Blitz is Reliable? RCM Blitz™ founder and facilitator, Doug Plucknette, is the author of Reliability Centered Maintenance using RCM Blitz™ as well as his latest book Clean, Green and Reliable: The Roll of Maintenance in Sustainability.